When you get sick, a doctor will typically prescribe you to take a dose of medicine for a directed amount of time. However, did you know there are several other solutions available outside the traditional hospital setting, including intravenous therapy? To understand if you would benefit from this IV approach, below is a brief discussion about what the procedure involves and what conditions it treats. 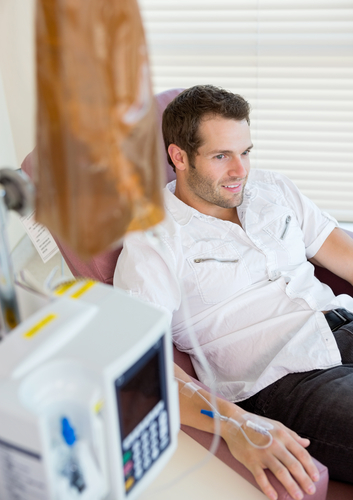 IV therapy has been practiced for several years, but typically only in the hospital environment. Due to this treatment’s myriad benefits, more independent health care facilities are offering it to help individuals feel better and save them a trip to the emergency room. IV therapy delivers liquids directly into the vein, for a fast way to get the solution into your blood system. The treatment usually lasts around 45 minutes and can provide an infusion of vitamins, minerals or medication, depending on what condition you’re experiencing. The solution can help individuals with a variety of different conditions feel better, including those who suffer from dehydration, migraines, chronic fatigue syndrome, fibromyalgia, and other prolonged illnesses that do not respond to typical antibiotics. Also, athletes and other individuals looking to improve their health experience the benefits by using intravenous therapy, as they get quick and direct access to a mix of vitamins and minerals. What Risks Are Associated With This Treatment? While intravenous therapy is typically safe, there are a few risks associated with this solution. Individuals with congenital heart failure should avoid having an excess of extra fluid pumping through their veins, so IV therapy should be limited at the discretion of their physician. Also, because this treatment requires a needle to puncture the skin, there’s a slight risk of infection. Further, it’s important to evaluate the number of therapies you receive to ensure you’re not overwhelming your body with too many vitamins and minerals, which can cause sickness as well. Integrative Medicine of New York, PLLC, in Westbury is a state-of-the-art facility that offers diverse treatment options for patients, including intravenous therapy. Their skilled team provides effective alternatives to traditional treatment plans to ensure your health and well-being. If you live in the tri-state area and would like to schedule an appointment today, call (516) 759-4200. You can also visit their website to learn more about their range of services.